Portsmouth High School - League Runners-Up: Back row Left to right: Mahkaila Bivens, Hanah Martin, Gus Shoemaker, Jaden Morris, Trevor Wampler, Jay St. John. 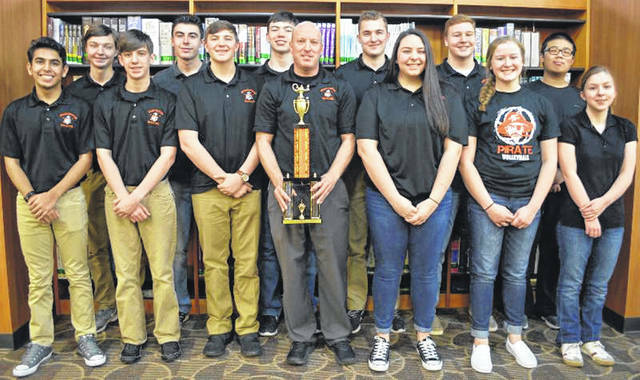 Wheelersburg High School’s Academic Competition team, led by Coach Brian Oakes, captured the title of 2018-19 Academic Competition League Champions on Dec. 6, 2018, with an undefeated season. The Portsmouth High School team, led by Coach Amy Keating, won the Runner-Up title. League competitions took place from September through December at the South Central Ohio Educational Service Center (ESC), in New Boston. Each year the ESC oversees Academic Competitions, using the Ohio Academic Competition format. The purpose of this competition is to encourage higher-order thinking, recognize outstanding achievement, and promote academic excellence among participating high school students. Approximately 250 students participated in Academic Competitions this year, including teams from Clay (finishing 8-5), Green (8-5), Minford (11-2), New Boston (2-11), Northwest (7-6), Notre Dame (8-5), Oak Hill (3-10), Portsmouth (12-1), Scioto County Career and Technical Center (1-12), Sciotoville Community (6-7), South Webster (3-10), Valley (9-4), West (2-11), and Wheelersburg (13-0) schools. The Southern Ohio Academic Competition Tournament will take place at Shawnee State University on March 14, 2019. Tournament winners will advance to the 35th annual OAC Regional Competition on April 6, 2019 in Lancaster, Ohio. League winner Wheelersburg High School, along with Tournament winners, will advance to the Regional Competition. Teams that win at Regional Competition will advance to the State Competition in Columbus on May 11, 2019. 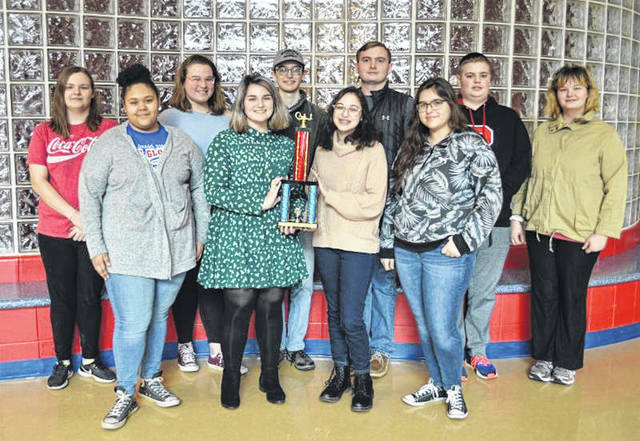 Portsmouth High School – League Runners-Up: Back row Left to right: Mahkaila Bivens, Hanah Martin, Gus Shoemaker, Jaden Morris, Trevor Wampler, Jay St. John.